Cheap bath wedding favors are a great wedding favor, but when you look at the pre-packaged favors available they can be expensive, there is an alternative and that is to put them together yourself. You don't need to be very crafty for this project it is more about being clever as to where you buy the parts. or there are some great romantic ideas that can work with any theme. 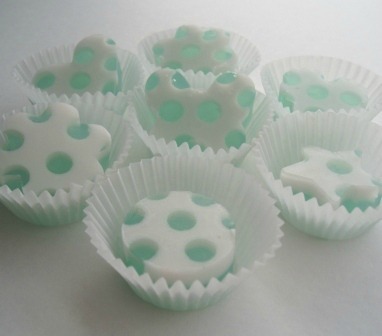 Romantic bath favors could be heart shaped soaps, confetti, soap petals or just go with romantic colors. If you don't fancy making your own here are some to buy, and they are very cute! Plus it's nice to get ideas for your own favors. anything that is small enough to sit on the wedding tables. Plus you will probably want to have a little bag or favor box to gift your favors to your guests. You normally buy by the weight and for a normal bath 'serving' you are looking at 1/3 to 1/4 ounce. Multiply that by the number of favors you need and you have the quantity you need. As you only need a very little for each favor you could look at buying enough without the favors becoming expensive. These big bags of lavender bath salts from Amazon would easily make 100 favors and you would be giving a generous amount for each favor. You can also get all sorts of other bath salts from Amazon by clicking on the link. I think that has to be one of the cheapest favors! You can also look at making your own bath salts. It really is not that difficult as all you will need is salt and essential oils. Go careful on the essential oils as they are very strong! A good proportion is a few drops for every 16oz of salt. You could add color to the salts but that can be unpredictable and you don't want to be responsible for turning your guests blue! Now have a look for the packaging, it could be a simple favor box, a drawstring bag, a mini glass jar, or an envelope - think about what works for you and your budget. 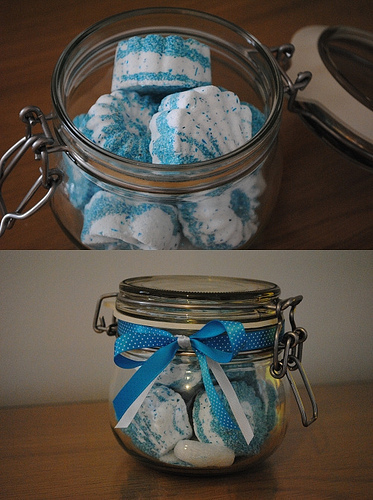 All you have to do now is to put the bath goodies into the packaging, decorate if needed and you are all done! An extra touch is to write a personal message maybe thanking your guest and hope that they can relax after.